Yup, I’m a southend snob, and will do anything to avoid crossing the ship canal. 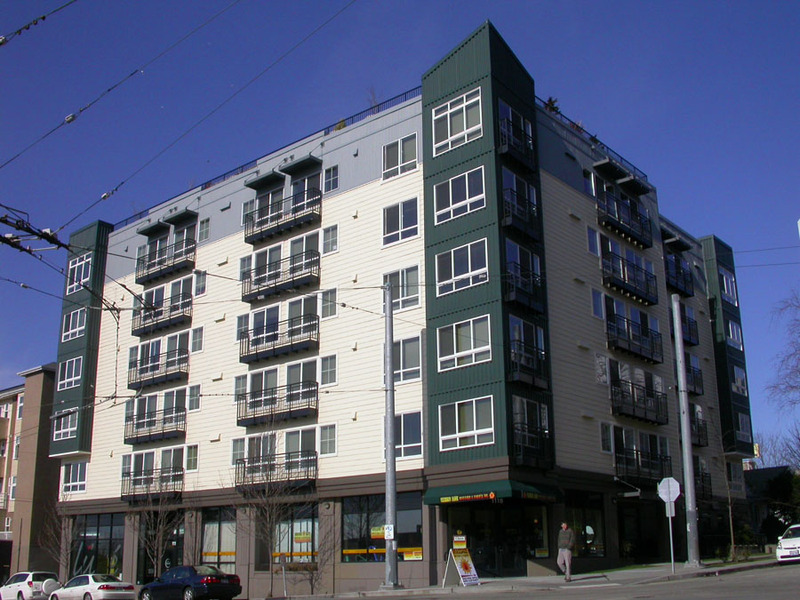 But see below for evidence that I’ve been up there: pics of new and newish multifamily housing that I came across semi-randomly. I don’t have too much to say about these other than it all makes me very sleepy. 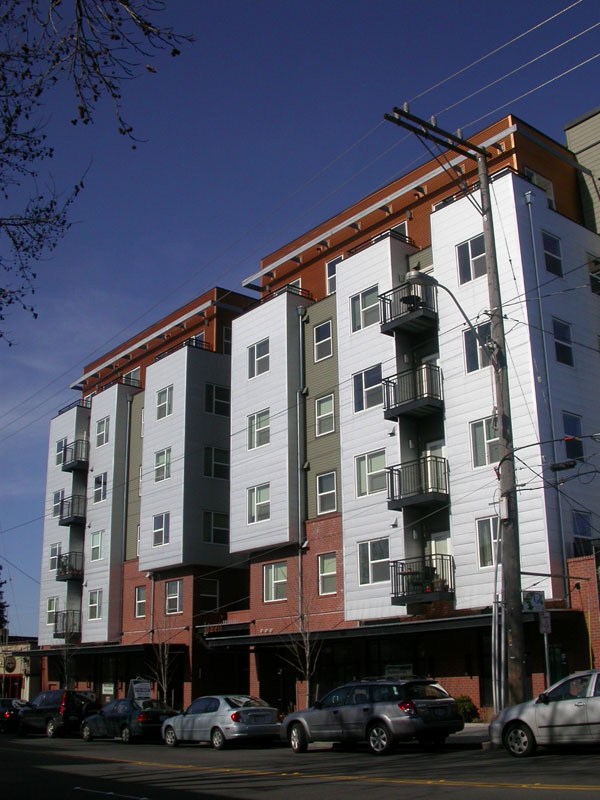 Granted, it’s a big challenge to bring high-quality and/or innovative design to market rate housing — the economic equation invariably favors stripping out any details that aren’t critical to keeping the building from falling down (“value engineering”). Mediocre is good enough. But these buildings will be defining the character of our neighborhoods and the image of our city for decades to come. We need to do better. 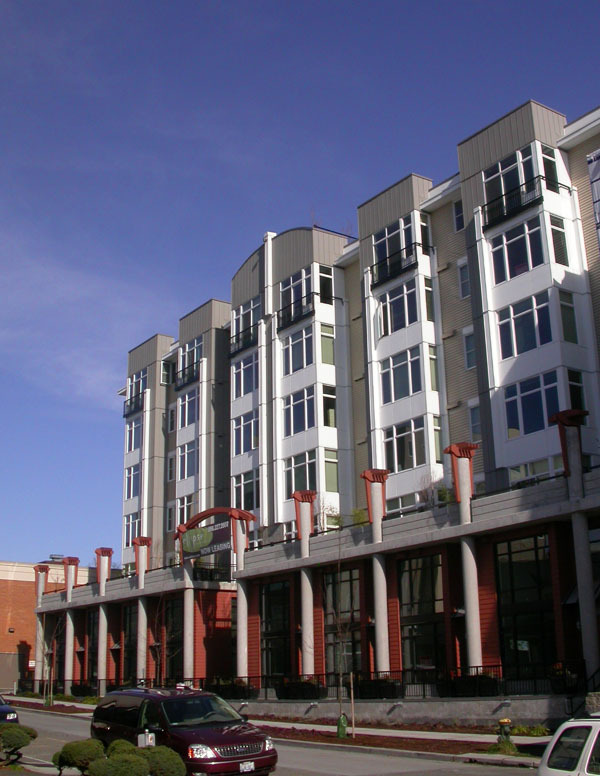 The Helix Apartments, 12th and 50th in the U-District. This is the best of the bunch, solid design, though nothing about it really stands out from dozens of other similar projects in Seattle. And no, it isn’t two separate buildings, but the designers hope you will think it is. Right across the street from Helix on 12th, the Ellipse Apartments, with units fronting the street that would appear to be live-work. Not sure why, but something about it vaguely reminds me of Florida. Dig those circular concrete columns poking up through the post-tensioned (PT) slab. 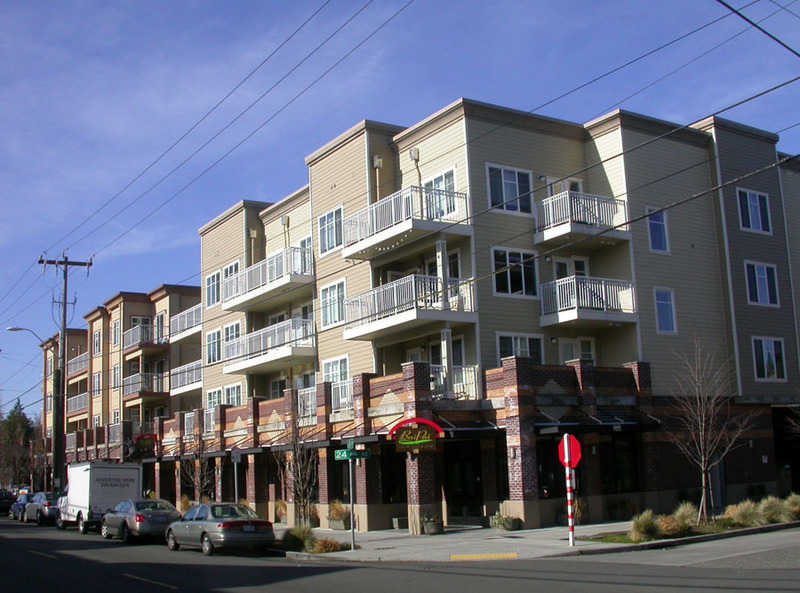 A block south of the two projects shown above, Acacia Court, at 12th and 47th, designed with students in mind (i.e. small units). Those are some serious pot balconies (pot as in flower). Alas, nary a pot to be seen. This is Dwell Roosevelt, condos at 65th and 11th in the Roosevelt District. I like its simple forms, but something about the mirrored symmetry and the 2nd story brick feels clunky to me. The Varsity II Apartments, at 65th and 23rd in Ravenna. Sigh. The retirement home vibe, but with bigger balconies. Weird how they let the thick gray PT slab punch through the brickwork. 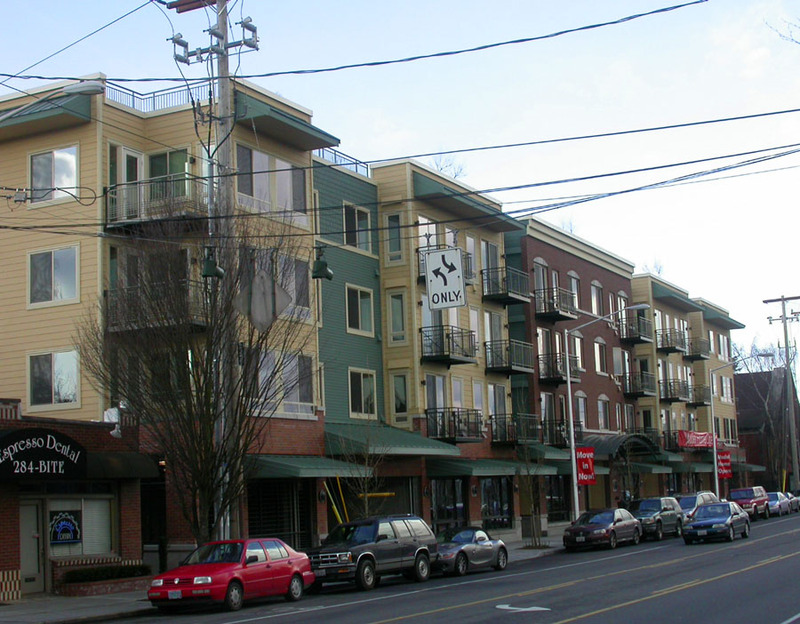 Fini Condos at 68th and Greenwood on Phinney Ridge. I don’t get it. What is this thing trying to be? My, what big green eyebrows you have! Posted by dan bertolet on	Monday, February 18th, 2008 at 10:44 pm. You can follow any responses to this entry through the RSS 2.0 feed. You can leave a response, or trackback from your own site. Geez DB, perhaps my architectural sensitivities aren’t as fine-tuned as yours, but I’m thinking these aren’t all that bad (save for maybe Acacia). I would say that on the whole we’re seeing some more visual variety and good ped environments in these new projects. I’m pretty much clueless as to what it might cost to design and build the buildings that you are imagining to be far better than what we are seeing being built, but I do wonder how it would bode for the affordability factor? Yo, Dan. Nice blog. getting some pub all over the place. Can you do the reverse and give us some example of well done projects that are not high-end condo? We developers would love to brick everything up, use more glazing (high-end windows, etc) but the economics are not there. We are challenged to bring anything to market that hits the 90-130% AMI rents as it is. And its not just profit margin, its financial feasibility. If we don’t have a minimal threshold of returns, we can find debt or equity, and no project would go forwards. flotown and michael: I knew this was a risky post. I understand the challenges of financing housing projects, and yes, mediocre infill is better than no infill. 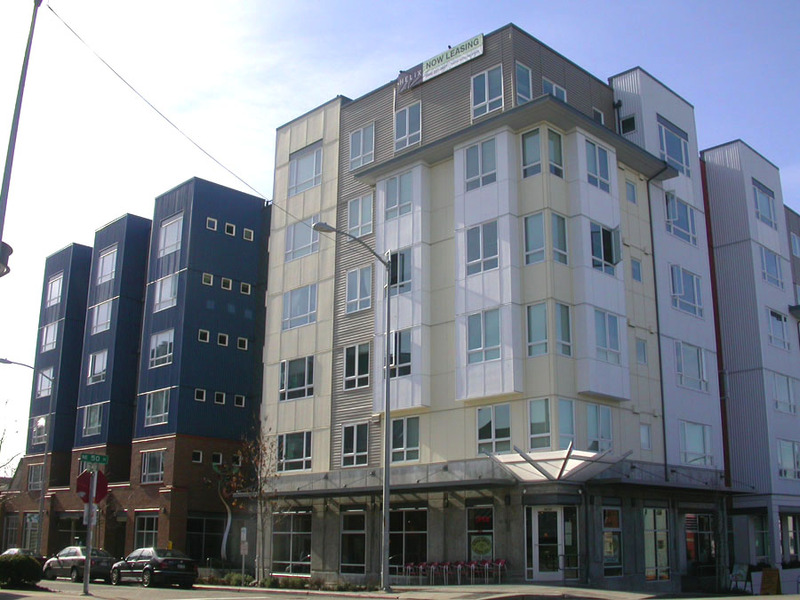 What impressed me about David Baker is that his firm has produced some affordable housing projects in San Fran that have great design.